Entry level Surface Pro 4: the only iPad Pro you'll ever need? With the Apple iPad Pro due out any day now, we can expect an avalanche of coverage extolling that tablet and its add-on Pencil. As an iPad early adopter, I admit that I'm excited by the prospect of a 12.9-inch iOS tablet with pen. It's really the device that I dreamed of when I bought the first gen iPad five years ago. Thinking back to the release of the first Surface Pro, I remember thinking what a compromise it represented. Yes, it was penabled and pressure-sensitive and yes it ran real desktop applications. But that first generation Surface was an odd 16:9 aspect ratio that made the display seem smaller than it really was. The SP 1 and 2 were also thick and heavy and could run hot, requiring fans that ran loudly and often. Even though the Surface Pro 3 got the aspect ratio, thinness and weight right, it still had its design issues.The Core i5 SP3 model that I own tends to run very hot. It sits docked on my desktop nowadays and its fans blow constantly for no obvious reason. So while my decision to purchase the $899 entry level m3 Surface Pro 4 was partially financial, it was also motivated out of a desire to try the most "iPad-like" Surface Pro ever: thinner and lighter and, most importantly, fan-less. The other models in the Surface Pro 4 line likely make better laptop substitutes, but I can definitively state that the Core m3 Surface Pro 4 is the best pure tablet that Microsoft has ever built. And while an additional 0.6 inches of screen room would be nice, I will go out on a limb and declare that I don't think there will be anything else to envy about the iPad Pro. The Surface Pro 4's 12.3-inch, 2736 x 1824 (267 ppi) display is breathtaking and bright. So bright, in fact, that I have been using it between 25-50% brightness while typing this post in both dark and reasonably lit rooms. Battery life is better: perhaps not to iPad levels or the 9 hours Microsoft promotes, but definitely more than the 5-6 hours maximum I get on the SP3. The physical differences between the SP4 and its predecessor are more difficult to discern. The tablet is thinner (11.50 x 7.93 x 0.33 in) and lighter (1.69 lbs for the 6th generation Core M) but the difference is so slight I would not have noticed unless it was pointed out to me. I definitely approve of the thinner bezels. An infinity display might have gotten the screen size to above 13 inches, but you really need somewhere to rest your thumbs while in tablet mode. This bezel width is probably as narrow as you realistically ever want them to be. I may have been one of the only pen users who wasn't bothered by the physical location of the Windows button in the SP3. I honestly thought I would miss its functionality, but now with Windows 10 the on-screen equivalent is always within easy reach. I have to do a lot of screen captures for this site and I would always use the Windows button + volume down combo to grab screenshots. Now with the Surface Pen, double-clicking the eraser button makes screen grabbing even easier. The Surface Pro 3 pen loop is gone, replaced by a powerful magnet in both the tablet and the flat side of the pen. When properly attached, the pen isn't going anywhere. See my separate review for a complete discussion of the Surface Pen itself. It's a huge improvement over the previous generation. So to sum it up, I love the Core m3 Surface Pro 4 and its new peripherals, but I would be remiss if I didn't mention a few gotchas. Like every other early Surface Pro 4 user, I ran into display driver issues. The Intel HD Graphics 515 driver kept crashing and there were odd color temperature shifts while scrolling some programs, especially the Edge browser. But firmware released November 2 included a new display driver that seems to have solved those issues. The only other problem I've encountered is battery drain in sleep mode due to a bug in Windows Hello. As a workaround, you can disable Windows Hello, but I prefer to shut the tablet down between uses instead of putting it to sleep. Windows Hello is amazing face recognition technology that is hard to live without once enabled. It can be freaky (and awesome) when the computer recognizes you before you've even settled in to your seat. I find that the camera sees very well in low light, but does less well if I'm back-lit. An advantage the iPad has over Windows tablets is that it only is asked to run software built to its very specific capabilities. The m3 Surface Pro, on the other hand, will be expected to run software designed for desktops with much more RAM, true quad core processors and discrete GPUs. So looked at in that context, it's a miracle that the ultra-thin, 4 GB device m3 Surface Pro can run these applications at all. Some bottlenecks are absolutely to be expected. But the truth of the matter is that the m3 model didn't just eke by in my tests; it actually runs most of the software I tested very well. RAM and 128 GB of storage space will ultimately be more of a bottleneck than the m3 processor and gpu speed, in my estimation. I was very surprised to find that the m3 SP4 beat the i5 SP3 on all the benchmark tests I ran. Only Geekbench gave the i5 a slight advantage. CrystalDiskMark tests of the SP4's NVMe Samsung MZFLV128 GB SSD were decidedly mixed vs. the i5 SP3's 256 GB Samsung MZMTE256HMHP. The SP4 was 50% faster in sequential Q32T1 read speed and slightly slower in every other read category. The SP3 was almost twice as fast in every write category, except in 4K writes where it blew away the SP4 with a 91.8 vs. 11.43 MB/s. 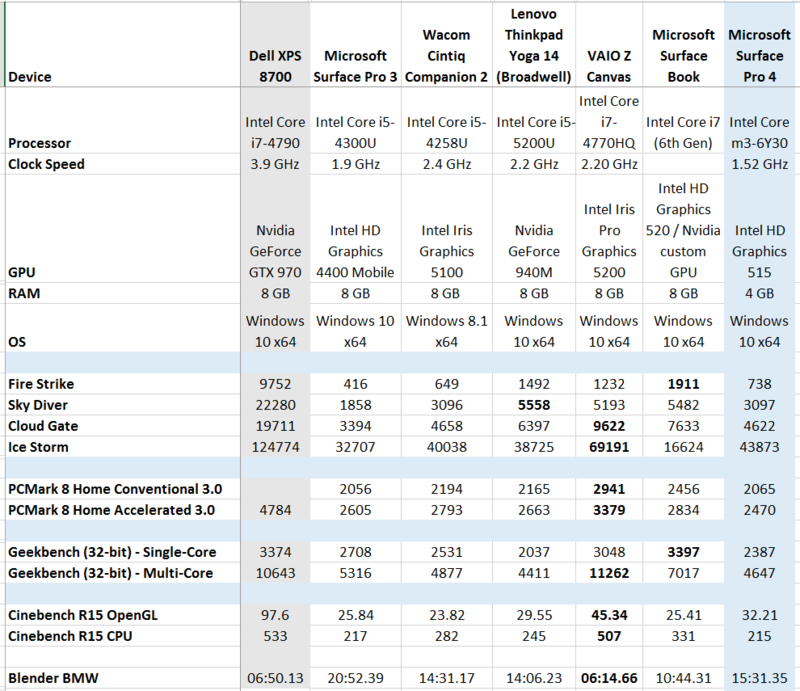 I don't know what to make of the results, except that synthetic benchmarks are weird. Make of them what you will. In real world use, I found drawing with the m3 Surface Pro 4 to be almost indistinguishable from higher end devices. Performance can vary greatly between applications but I believe that has more to do with how well optimized that software is vs. any specific hardware limitation. UPDATE 11/11/15: Brad Colbow's video review and my further testing uncovered a problem with brush stroke tapering and significant Photoshop lag that may be a deal breaker for you. See video examples here. Before reviewing inking performance, I thought it would be helpful to review the not-so-obvious steps I recommend in order get the most out the tablet and Surface Pen. First, calibrate your pen in the control panel under Tablet PC Settings (see right). The N-Trig digitizer in the Surface Pro 3 and 4 is much more accurate than the Wacom EMR digitizers found in the Surface Pro 1 and 2, but this step insures that the on-screen cursor is located as close as possible beneath your pen tip. Second, download the Surface app from the Windows Store (pictured left) and set your pen pressure curve. I set my curve all the way to the left (firm or hard, see image below, left). This insures that I get the widest range of pressure possible. Light strokes yield very light lines, but you have to apply a lot of pressure to get to 100% black. If you prefer not to press so hard, try changing the curve toward the right or soft setting. Depending on your software, you may be able to further adjust the pen pressure curve. In Manga Studio 5/Clip Studio Paint (above, right), the setting is under the File menu, Pen Pressure Settings. I recommend selecting Use Multiple Strokes. Then, as you draw as many light and dark strokes as you like, the curve adjusts itself automatically. Note that the combination of global pressure settings and software may be too much. If you're only going to work in one app, it might be best to leave the global setting at the default and use only the application's pressure adjustments. Most current software is RealTimeStylus aware and no longer requires a Wintab driver to understand pen pressure. In MS5/CSP, I make sure that TabletPC is set under File>Preferences>>Tablet>>Using tablet service. If your software requires Wintab, the 64-bit installer can be downloaded here: Wintab-1.0.0.20-64-bit.zip. To reduce this laggy sensation, I recommend turning off or reducing the size of the hardware cursor. In Windows 10 Settings>>Devices>>Pen, you can turn the cursor off entirely (see above). In MS5/CSP, you can go into Preferences>>Cursor (pictured right) and set your pointer to as small as a single pixel dot. One of the most frequent complaints I hear is about perceived drawing lag. A great deal of this is due to a flaw in the way that N-Trig tracks the pen while hovering. As you move your pen above the display, the cursor always struggles to catch up. But assuming you've calibrated your pen, you can be sure that where you tap is where your stroke will begin. Parallax, or the distance between the physical pen tip and the display, has been dramatically reduced by the SP4's thin glass and hiding the hardware cursor further improves the experience. Without the hardware cursor in the way, you'll find that the m3 SP4 pen keeps up with your strokes very well. I tested with a zoomed out A4 350 dpi canvas using the MS5/CSP Colored Pencil set to 600 px and only then was I able to perceive a very slight delay in the completion of my strokes. At my typical brush range of 12-50 px, there was absolutely no lag. In Adobe Photoshop CC 2015, I set up a similar canvas. Textured brushes had no trouble keeping up even at pretty extreme sizes. However, airbrush strokes above 100 px were very laggy, taking as much as an additional second to complete. Turning gpu acceleration on and off didn't have any discernible effect. Hover distance has supposedly been improved in the SP4 but since that and palm rejection are not an issue in either MS5/CSP or Photoshop, it's difficult for me to notice much difference. Palm rejection is critically important in programs like Autodesk Sketchbook Pro, which doesn't yet offer a way to distinguish between pen and touch input. In that program and others like it, touch input is disabled when the pen is recognized (and the live hardware cursor appears on screen). Because I like to rest my hand on the display and tilt my pen up and down as I work, I can't always keep touch disabled. As a result, my pinky knuckle will always leave stray marks in that software so I simply avoid using it. As far as performance goes, Sketchbook Pro 7.3.1 runs very well on the m3 Surface Pro 4. I didn't notice any lagginess testing with a 3000 x 2000 canvas and 150+ px brushes. I also tested the tablet with the desktop application trials of ArtRage 4, Corel Painter 2016 and the MangaLabo. As mentioned above, performance varied somewhat between applications and specific brushes. They were all useable but will probably improve if their developers optimize their code for Windows 10 and the SP4 driver set. I also ran the Windows Store apps Sketchable, Graphiter, and Autodesk SketchBook for Windows Tablet. They all run fine, except for the inability to turn off touch input. As I've written in a couple of recent posts, among store apps, I really recommend Sketchable. It's got a great brush engine and selection of features. The features I've seen in the upcoming 3.0 release begin to rival SketchBook. If there is any nagging doubt about Microsoft/N-Trig vs. Wacom Active ES pen technology, the Surface Pro 4 and the VAIO Z Canvas pens nearly settle the debate. The performance of the two technologies is now almost indistinguishable. Wacom claims twice the number of pressure levels, but I certainly don't have the hand control to feel the difference. Diagonal pen jitter still exists but it will only be noticeable to those who draw extremely (and unrealistically) slowly. There is no quantizing (segmenting) or fast drawn curves except in older software like Fresh Paint. Small fish tails that would sometimes appear at the end of pen strokes appear to have been eliminated. The only remaining advantage that Wacom has over the Surface Pen is in its Feel driver, which offers a radial menu, button programmability and much higher resolution calibration. And Wacom's older EMR tech found in the Cintiq Companion, among others, still reigns supreme for its tilt support and variety of pens and nib textures, etc. Unless those are absolute deal breakers for you, there's nothing else not to like about drawing on the new Surface Pro 4. Whether the m3 model is sufficient for your needs is really up to you. You simply need to weigh how much you value more closely approximating laptop performance vs. the quiet and portability of a pure tablet sketchbook. As I stated at the top, unless there's some miracle iOS app out there ready to be sprung upon the world, the m3 Surface Pro 4 is the best iPad Pro you'll ever own.